During this week and throughout the year, Farm Bureau is encouraging farmers to make safety a priority on the farm. 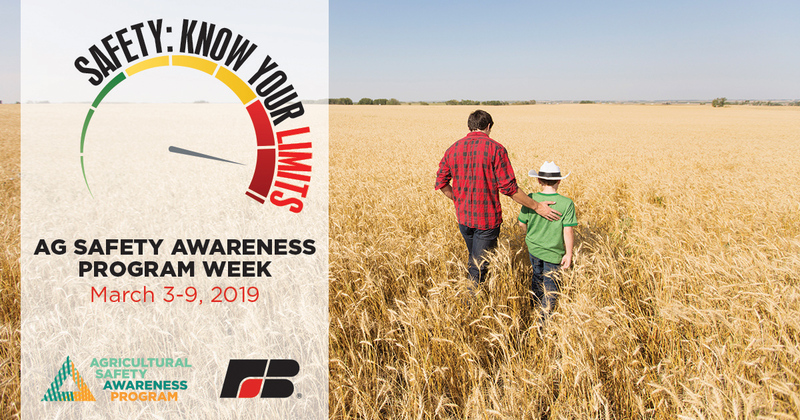 The Agricultural Safety Awareness Program is a part of the Farm Bureau Health and Safety Network of professionals who share an interest in identifying and decreasing safety and health risks. For more information and resources, visit the ASAP Facebook page. Visit the Centers’ YouTube channel (www.youtube.com/user/USagCenters) for new content and fresh ideas about how to stay safe while working in agriculture, forestry and fishing. Join the movement to keep farms safe and share your own safety messages on social media using the hashtags #KeepFarmsSafe, #ASAP19 and #USAgCenters. The 11 U.S. Agricultural Safety and Health Centers (www.cdc.gov/niosh/oep/agctrhom.html) are funded by the National Institute for Occupational Safety and Health.